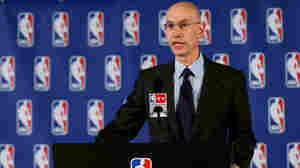 April 30, 2014  NBA commissioner Adam Silver said he'll do everything in his power to ensure that LA Clippers owner Donald Sterling sells the team. Michael McCann, director of the Sports and Entertainment Institute at the University of New Hampshire School of Law, explains the NBA rules behind this. April 30, 2014  LA Clippers fans have always supported their team, if not its owner Donald Sterling. We check in with people outside the Staples Center, where the Clippers played Golden State in the NBA playoffs. April 29, 2014  The contrast between the racial makeup of the league's ownership class and its players usually goes unmentioned. 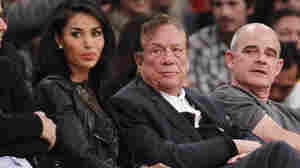 But the Donald Sterling fracas has pushed that not-quite-subtext to the fore. 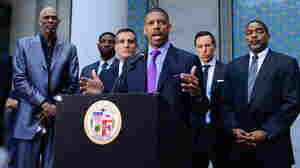 April 29, 2014  Observers say the Clippers owner's current trouble is only the latest in a 30-year record of racism in LA — although he has also been honored by the NAACP for his charity work. April 28, 2014  Keyon Dooling, a former Los Angeles Clipper and founder of the Respect Foundation, discusses his time playing for the team under owner Donald Sterling. Do Fans Have Any Responsibility After Sterling's Comments? April 28, 2014  Host Michel Martin speaks with business ethicist Jack Marshall about an appropriate response from the NBA, the players and the public after allegedly racist comments made by the L.A. Clippers' owner. 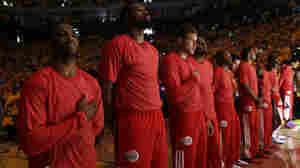 Should Bigotry Get You Kicked Out Of The NBA? 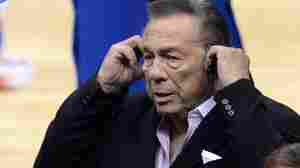 April 28, 2014  There has been widespread outrage to racist comments allegedly made by L.A. Clippers' owner Donald Sterling. Host Michel Martin learns more from sports columnists William Rhoden and Christine Brennan.